Resources Global Professionals (RGP), a leading global consulting firm with more than 4,000 employees worldwide, was in the midst of a transformation. Poised for growth, the company reorganized itself and launched a new revenue marketing function to enable consistent and cohesive marketing communications, and arm sales for success. The new VP of Revenue Marketing had a lofty set of goals to meet. RGP looked to PMG’s expertise in building marketing and sales enablement assets, including developing a core set of buyer personas and a series of campaign strategies that would communicate the value of the company’s advisory, project-based, and staffing services to executive buyers. Developed a group of unique buyer personas. Conducted stakeholder and customer interviews to inform the personas, which included demographics, a “day in the life,” business drivers, objections & answers, KPIs, content recommendations, sources of information, messages, and more. Translated insights from the personas into a comprehensive company messaging framework to inform campaigns. Concepted, copywrote and designed a new first meeting presentation to enable RGP’s sales team for success. Included new messaging, corporate positioning, solutions overviews, persona and vertical focused slides, and customer success stories. 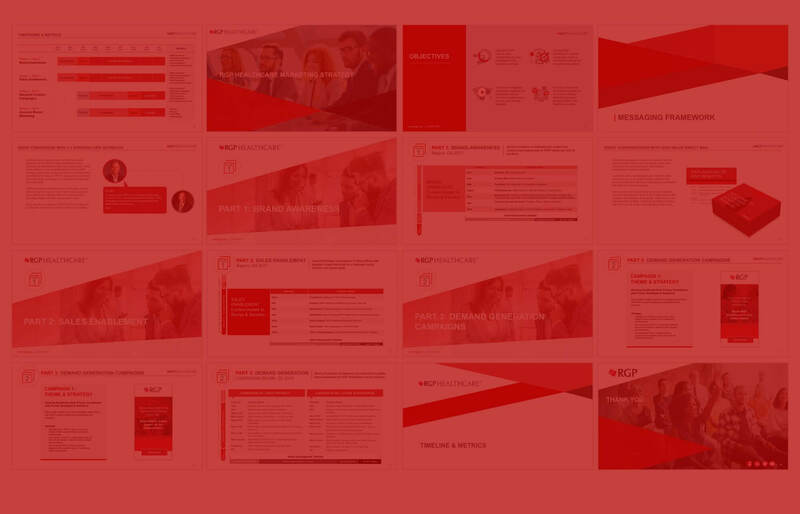 Extrapolated that presentation into a new corporate PowerPoint template, including multiple customizable graphics and charts, as well as approved stock imagery for maximum flexibility. Concepted, developed, and designed (with original artwork) an executive town hall presentation for RGP’s new VP of Revenue Marketing. Developed account-based marketing framework and campaign strategy to target high-potential accounts. Performed an audit of RGP’s marketing tech stack and martech vendor list. Made recommendations for what vendors/solutions to remove, replace, and/or add. This evaluation provided RGP all of the tools it needed to execute strategic marketing activities. ”PMG brings not just agency expertise to the table, but also insider knowledge of B2B enterprise marketing. I’d highly recommend PMG to any company looking to drive lead gen, and meet revenue goals with creative content and campaigns!